I have never had a problem leaving Calgary. That probably sounds worse than it is… I have grown to really enjoy coming to Calgary, and wish some of my visits were longer. I am simply saying that I cannot recall ever having any issues with traffic, at the airport, or anything. On most days that would sound like an endorsement of Air Canada and the CATSA security screeners. Today it is a little different. There was no mention of flooding as we landed yesterday, and frankly the first I heard of it was on the radio driving into town. I assumed they were talking about minor flooding in outlying rural areas. I even gave a cursory thought of heading down to Prince’s Island Park for a walk. That would have been ill-advised at best it would seem, as the entire area is experiencing the worst flooding in a century. It was easy to miss it… I got to the hotel yesterday and it was dry. I walked to the office and then went out for lunch without a problem. I even got to and from my event last night without concern. However the entire office was abuzz with talk of the flooding, of areas washed away, of trailers lost, and of people stranded. When I arrived at my event I found a room of 18 people instead of the 50 who were registered. Most of them simply couldn’t get into town. Fortunately I had made dinner reservations at a restaurant near my hotel, and I knew I would be alright. My colleague and I got to Saltlik and it was a lot busier than I had ever seen it… people were stranded and couldn’t get to wherever it was they had to go. There were even rumours that the downtown core would be evacuated, like so many of the suburban areas already had been. I was not concerned for myself – sitting in a dry restaurant and a dry bottle of wine and across the stream street from my dry hotel and a 20th floor room. As we finished the last of the bottle of wine and contemplated the idea of coffee a piercing alarm sounded. Once I determined where it was coming from I immediately tuned it out and heard the sounds of other alarms from nearby establishments. The staff came and hurriedly told us that it was not a drill, and the Police were ordering them to evacuate. While the immediate area was safe it was clear from the mood that many of the staff would have a hard time getting home, and they had to leave early to try to get there. In speaking with the hotel clerk she told me that there was no clear answer, but I should leave myself plenty of extra time to get to the airport… I asked her to adjust my wake-up call based on that. Sirens pierced the air all night long as emergency workers dealt with the storm. 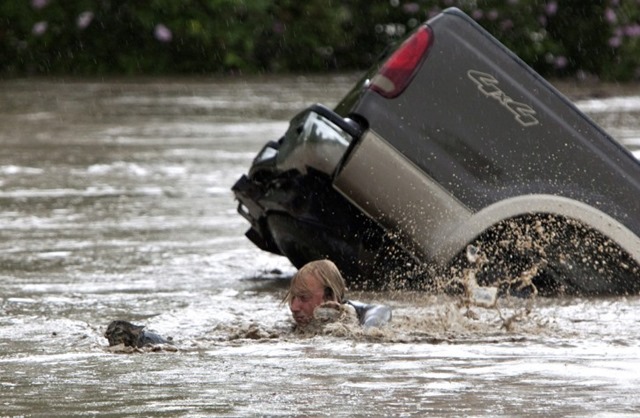 The Calgary Flood of 2013 is the worst the area has experienced in a century. it is a testament to the training of the emergency workers that to date no deaths have been reported, but the damage is devastating. Leaving the city this morning I saw Police blockades preventing inbound traffic; as I got onto the highway I saw the normally calm river appearing like white water rapids, much higher, much closer than I’d ever seen them. While I am glad I had no issues getting to the airport, my thoughts and prayers will remain here today… and with the people of this great city. Stay safe friends.